On the whole, it seems that actors spend more time looking for their next gig than actually working on one. It's one of the many peculiarities of the profession. As such, they get far more experience with rejection than the average professional. How do they do it? Where does this superhuman resiliency come from? I once read that Mark Ruffalo went on close to 800 hundred auditions until someone finally hired him. That level of persistence is astonishing when it seems that not a single casing director believes enough in you. But that's just the thing: in order to survive this industry, you need to believe in yourself enough to make up for it. When I made the decision to set aside my writing career to pursue an M.F.A. in musical theater at The Boston Conservatory, I was well aware of the major life change I was embracing. Trading in my tech reports for tap shoes was a drastic transition, but in my mind, there were some similarities between the two careers. Handling the judgement from readers--the sometimes harsh comments from an audience made bold by their online anonymity--could be hard to handle. 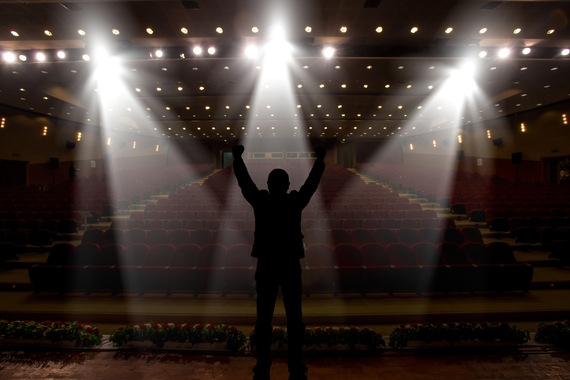 So what would be harder about performing for a row of watchful eyes in an audition room? I was acutely aware of the risks, the possible pitfalls in sidestepping from journalism to musical theater, and I knew all too well my weaknesses and my strengths. I knew them so well that I thought perhaps I'd be immune to the inevitable letdowns to come. For me, the audition process has always been a simultaneously exhausting and exhilarating one. The morning before, the nerves are characterized by a fluttering feeling that steadily accelerates as my slot draws nearer. Shortly before I walk into the room, that feeling instantly surges into a rush of adrenaline. I've come to believe that this fight or flight response is natural--even necessary: I'm getting ready to allow myself to be vulnerable, and that's scary, so my body is simply preparing itself for any possible outcome. Once I finish my song (or monologue) and leave the room, a high sets in--a gentle kind of elation that buzzes through every cell. It's a cycle that I've come to know well as of late. Since I started school in September, I've been in and out of a handful of auditions and four rounds of callbacks. I keep telling myself that rejection will get easier with time, but the fact is, it hasn't. Certainly, I've trained myself to think of each rejection as a learning experience--making a mental list of the things I did well and the aspects I could improve next time. But at the end of the day, there's something innately crushing about searching for your name on a list and not finding it; the dramatic realization that they chose someone else instead. You begin running your audition over and over ahead, searching for a misstep, an answer as to why they didn't pick you. And you'll never know the answer. It doesn't matter how confidently you slated, how well dressed you were, how perfectly you nailed that high A or belted the last line. Directors are faced with a string of talented performers, many of whom had an impressive audition and could likely perform the role in question. What it comes down to is something so nuanced, so personal. The director either had a hyper-specific vision for this character or they had no idea what they were looking for. And the person they cast either fit their specific idea so perfectly or somehow made that character come to life in such a way that suddenly they knew what they wanted. These are factors that, as actors, we have no control over. We can control our own preparedness, but not directors' expectations. The funny thing about acting is that it requires the ability to assume a multitude of different identities and yet, while doing so, it's so crucial to have a strong sense of self. It's not necessarily about disappearing into these characters, but rather about empathizing with them so deeply that you are able to embody them in such a way that their thoughts and actions feel instinctive. There will always be traces of you in that character, and that's the way it should be. And a strong sense of self, I feel, translates to stronger acting choices. Ambivalence or self doubt, on the other hand, leads to weak decisions and inconsistencies in character. In other words, you cannot make it in this industry without a firm grasp on who you are, how you feel about things and what you have to offer. To depend entirely on the highs offered by approving directors or audiences is too risky, because the lows of rejection can easily drown them out. Your self-worth will surely suffer. Lately, I've been framing the casting process as comparative to dating. When it comes to your romantic life, you deal with rejection all the time. When things don't work out, you might even wonder, "Why not me? Am I not good enough?" At the end of the day, that rejection is merely preventing you from being with someone who wasn't right for you. And looking back, you might even be grateful that you didn't waste your time with that person. If we can think of auditioning in much the same way--as a compatibility test--maybe we can consider rejection a gift. Because as actors, we cannot shield ourselves from disappointment--and we shouldn't try to. But we can allow that disappointment to fuel our motivation. We can choose to spend more time looking for our next audition than obsessing over the outcome of our previous one. We can trust that, much like finding a significant other, we will end up where we are meant to be, where we have the most to offer and the greatest opportunity to thrive. This post is dedicated to The Boston Conservatory M.F.A. musical theater class of 2017.